The Days Inn Orlando Universal Studios North is located at the intersection of Interstate 4 and John Young Boulevard, Exit 79, just minutes from all major attractions and downtown Orlando. 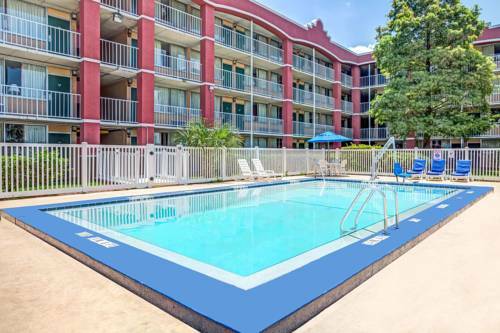 The Days Inn Orlando Universal Studios North is centrally located within minutes of Universal Studios, Islands of Adventures, Sea World Adventure Park, Walt Disney World, Epcot, the Holy Land Experience, Amway Arena, Citrus Bowl and all other major attractions. The Days Inn Orlando Universal Studios North offers a great shopping experience at the most elite, Mall at Millennia along with an excellent dining experience at one of the many famed restaurants located within minutes of the hotel, including those at the Festival Bay at International Drive. We are Close to the Amway Arena and the Orange County Convention Center. Our services include free wireless Internet connectivity, free continental breakfast, game room, swimming pool, free HBO and free ample-parking for all-types vehicles including rucks. Microwave and refrigerators are available at an additional cost. Pets welcome with a pet fee per pet, per night. There is an IHOP adjacent to the hotel.